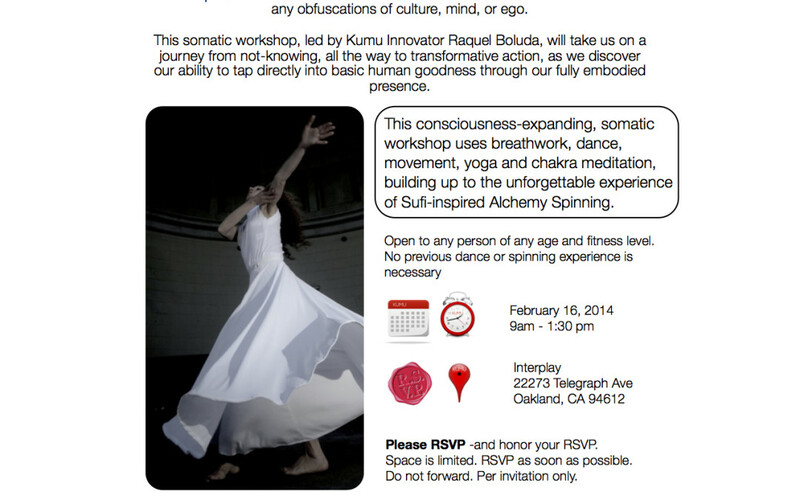 Join us for an Alchemy Spinning workshop, deep into the heart of the foundational values that inspired Kumu on February 16th, 2014 at Interplay, Oakaland. Our world is full of compassionate people doing “good work,” and yet the destructive complexity of our society continues to spiral. For compassionate action to be transformative it needs to be wise and free from any obfuscations of culture, mind, or ego. This somatic workshop, led by Kumu Innovator Raquel Santiago, will take us on a journey from not-knowing, all the way to transformative action, as we discover our ability to tap directly into basic human goodness through our fully embodied presence. This consciousness-expanding, somatic workshop uses breathwork, dance, movement, yoga and chakra meditation, building up to the unforgettable experience of Sufi-inspired Alchemy Spinning. Cost: Gift Economy. Kumu follows the Gift Economy principles and we are pleased to offer this workshop as a gift. Gifts back are accepted but not required. Please RSVP -and honor your RSVP. Space is limited. RSVP as soon as possible. Do not forward. Per invitation only.